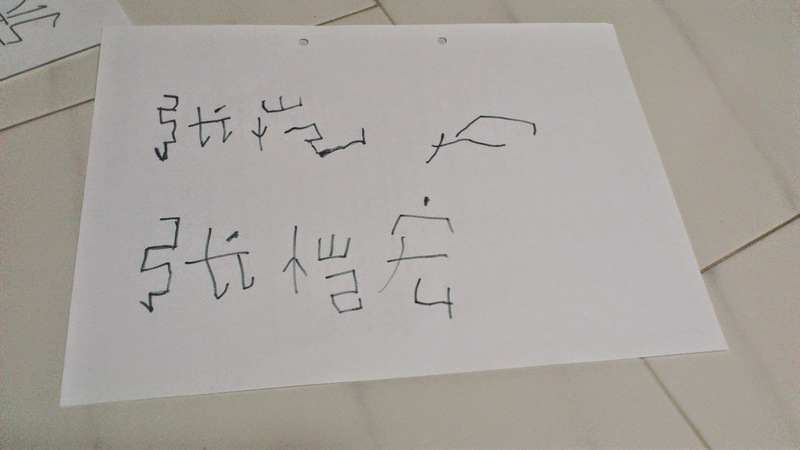 Our Lernen-Reise: IZ writes Chinese..
One fine day.. he wanted to write his Chinese name. Being Chinese illiterate (or in a better non-intimidating way, I don't read/write Chinese), I was at lost. Daddy is not good in Chinese too. Back to his Chinese name, so I couldn't just tell him I don't write Chinese, although he knew that much. He has never came to me with a Chinese book, not that he likes Chinese that much anyway. How did I solve the problem? I took his Chinese reader book and copied. I was not very confident coz I do not know the strokes and the sequence. I couldn't describe the strokes either. I let be, let him write however he wants. I can't tell anyway, you get what I mean? You can imagine how proud I was, when he could produce below, without referring to anything. He got it within 2 days and I thought he wrote really well. Phew! His Chinese name - I think he did really well!